U.S. Navy Petty Officer 3rd Class Jennifer Sahley salutes as a Ukrainian Navy Ka-27 Helix helicopter takes off from the USS Ross in the Black Sea. The two navies participated in the Sea Breeze 2014 military exercise September 8–10 along with Georgia, Romania and Turkey. Three NATO ships also took part: the Canadian frigate HMCS Toronto, the Spanish frigate ESPS Almirante Juan de Borbón and the Romanian frigate ROS Regele Ferdinand. The ships are assigned to the alliance’s Standing Maritime Group Two, one of NATO’s four Standing Maritime Groups. Naval forces from the participating countries worked together to strengthen interoperability and improve maritime security. 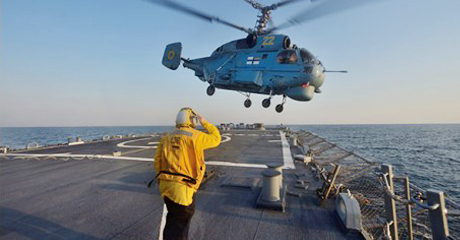 Ukraine and the United States co-hosted the exercise, the 17th annual version of Sea Breeze.